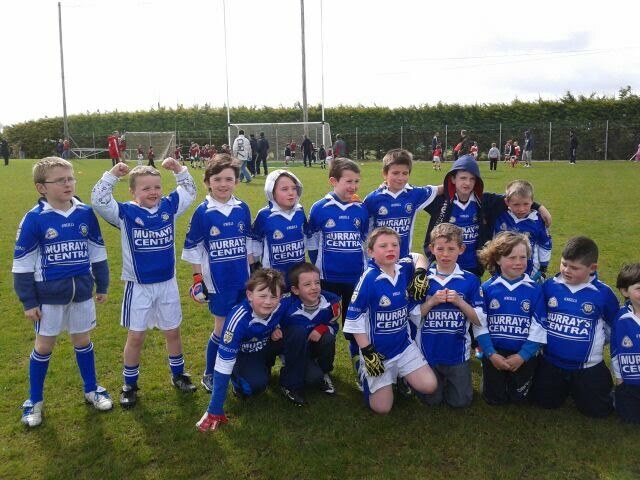 Our U8 players traveled in force to Whitechurch on Saturday May 11 to take part in a football blitz organised by Rebel Óg. We entered 2 teams for the 7-side competition which began at 10.30am. Each of teams played 3 matches against teams from the Tracton, Whitechurch, Shamrocks, Douglas and Whites Cross GAA Clubs. Even though they have been concentrating on hurling for the past number of weeks our boys played very well. They were more than a match for the other teams and did the club proud on what was their first ever outing for Brian Dillons. The coaches were very happy with their skill, effort, discipline and sporting attitude. Coaches from other clubs said they were very impressed by our lads. These players will be playing a football blitz on the second Saturday and a hurling blitz on the fourth Saturday of each month up to September this year. It is important that players continue practicing at home and attending training each Saturday at 11am so that they will be properly prepared. The coaches thank the parents who helped with transport on the day as well as the players who did so well. Players: Nathan Ryan, Conor Shovlin, Ben O’Driscoll, Conor Geraghty, Devon Gibson, Joey Gibson, Dara Maloney, Kane O’Brien, Michael Curtayne, Cillian Twomey, Evan Lane, Alex Quinlan, Luke Allen, Shane Ryan, Conor O’Brien, Robert Stevens. Coaches: Ger Daly, Bryan Allen, Nicky Quinlan, Alan O’Farrell.